Bright colors were so refreshing to see at High Point. It felt so alive with the colors of spring! I am a firm believer that bright colors in a home are both daring (look at those hot pink chairs from Stanley above, on paper it sounds a bit off-beat but look how gorgeous they are, especially next to the teal sofa) and fun! Pops of bright colors are a perfect way to think outside the box when decorating your home. Here are some of my favorite bright pieces! Although these pieces from Century Furniture have been in the line, they feel brand new with this new finish out by Century. 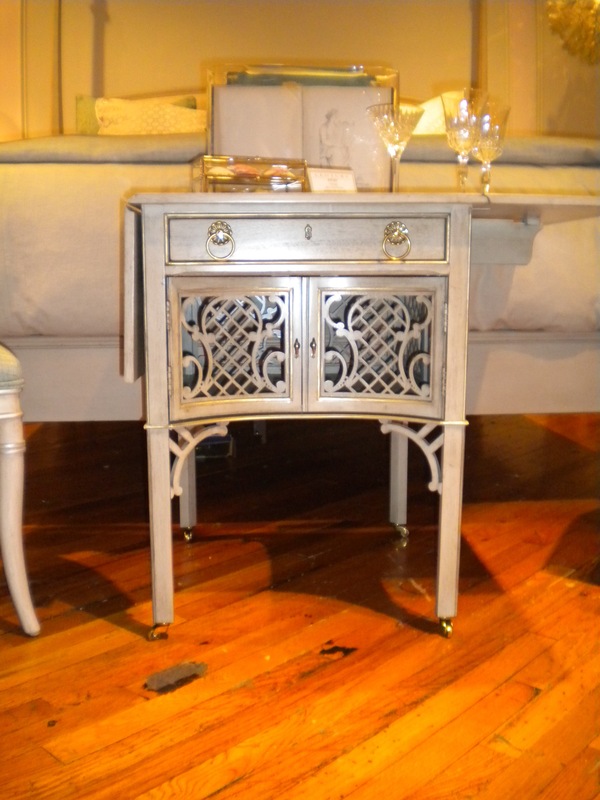 This finish, Sage with a Dry Gold Brush (though I think it has a bit of a warm cream color to it), was seen on a few pieces on the floor, and I love the way it freshens up the already beautiful look of these pieces. Back from High Point… Where to Start? After a week in High Point, I returned home to a mile long to-do list of things to take care of. I’m still coming down from sensory overload from my time at Market. As you might expect, my mind is exhausted and as a result (try as I may!) I could not pick just one thing to feature! In just a week, I came across some mind-blowing designs that I am saving for a later date because it is just too good to limit to only one room. Prepare to have your jaw drop!Anyway, High Point was really fantastic. Stay tuned for plenty of stories of wonderful people I’ve met, pieces of inspiration, and photographs from this wonderful week. After a week away from home, I may have a ton of things to catch up with, but I wouldn’t trade this for the world. I am incredibly grateful for these opportunities and to be able to do something that I love so much–and that I owe it all to you. Thank you for your readership and support! The photo above is a sneak peek at what’s to come… I immediately fell in love with this sofa from Century Furniture!